There are times, and a whole number of reasons why you might need to factory reset your Android phone. Maybe your phone is overloaded with apps and running slow, like mine just change its default language to Chinese which I cannot read or you’ve downloaded a recent update and it’s causing problems with your phone’s functionality. Or maybe you want to reset, to the factory settings because you’re selling your phone out to some other persons, whatever the case is it is a good idea that you should always do this when selling an old device, to other person this is very important for your personal interest, actually what this does is to wipe away your information from the mobile and also provide a fresh interface for the next user. One of the first major area people are likely to notice lag is on the home screen. If you are scrolling from page to page, and you are noticing frequent stuttering or freezing performance of your device that’s a real problem, and going from there, a factory reset might be a good start to fix such problems, this might be a problem with a third party constantly loading on the background. When it comes to applications may people want to play fast games and then also reply their messages on the go, as fast as they can so for this reason this is another place you can detect phone issues that could force a factory reset such as slow app launches and resumes heavily, contributing to the feeling of a phone being sluggish in performance and off course this can be so annoying and I know no one wants to be part of such stress. Similarly, in some occasions you might be getting a lot of Force Closes, on your mobile sometimes messages like unfortunately your application has stopped working, and some when you tap on app it will just flash and then it won’t even come up a reset could fix this matters. Hence Android gadgets are multitasking environment; app interactions are sometimes to blame for most of these malfunctioning. Another good time to reset your android device will be when new updates are released although you can update your device software and start enjoying the new features but for me I always want to start afresh by in putting my goggle account again downloading my apps and so much, what this does is to keep in track and in check, and also lets me be in control of my device in case of malware or other third party slicking applications. You can factory reset your android device by clicking on setting>>>> >> Account >>>>> Backup and Reset. A dialog box will appear asking if you want ERASE EVERYTHING. At this point your android device will reset automatically after a few minutes and you will have a brand App free device. 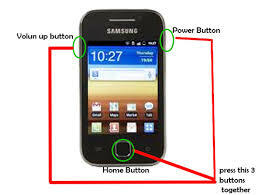 Or in the other way android reset can be done by holding down the Home button, the Volume up and down button and the power button at a time for a period of 60seconds or less and then your phone will reset automatically. When you reset your device there several changes you will notice this is why, most times I do the backup and reset plan to avoid lost of data from my device, so why you are in a hurry to reset your phone because of it’s annoying behave, you should also consider backing up your files on goggle drive, memory device or any other storage ,to avoid lost of information and data from your phone, the good news now, is that goggle has provided everyone with memory storage to save and backup files, so no need to panic about data lost anymore. Another thing you should bear in mind is that you have to login your goggle account again, to get access to play store which allows you to update your applications, afresh again, and when all these are done perfectly your device will come back to it’s status. Application will not start: the application was installed incorrectly, or there is a version conflict between the applications on the system exists or the system might b experiencing memory access error. A reboot of the device and a check If there is a pre-existing app might be a breakthrough to success. Application will not install: you are trying to install an application that needs to overwrite a file that is currently in used on the system, in this case a system update will be an option to fix this problem. Application not found: one or more of the application files has been deleted, moved or become corrupt, to fix this; you will need to restore the application or reinstall the application again. General Protection Fault: An application is accessing Random Access Memory that another application is using or the application is attempting to access a memory address that does not exist. Illegal operation: An application is attempting to perform an action that the device does not permit. System will force such operation to stop unless your disable the firewall which might even lead to exposure to attackers. So the best way is to stop the operation an find a way to do it the appropriate way. Window stores application not working: this can occur if the application license is out of date or out of synchronization with the license installed on the system. It can also occur if the application is damaged in some way, such as missing or misconfigured files. When this occur a system update will be our only chance to success.